Welcome To Young Blizzy Music Blog. It's All About Entertainment, Music, News, Events,Lifestyle, Fashion, Beauty, Inspiration. Pierre “Pee" Thomas, the CEO of Quality Control Records, has welcomed a baby with Lira Galore less than two months after he welcomed a child with another woman. The father-of-5 welcomed a baby girl with Instagram model Lira Galore this week. In March, he welcomed a child with Instagram entrepreneur Kaylar Will. He has three other children from three other women. Lira, 25, was engaged to Rick Ross but broke up with him due to infidelity. She then moved on to several more rappers and ball players, before getting pregnant with Pee's child. Pee took to Instagram to announce the birth of his and Lira's child. Pee's record label boasts a number of hip-hop stars including Cardi B, Migos, Lil Baby, Lil Yachty, and more. President Buhari will today Thursday April 25th, proceed to the UK on a private visit. A statement from Mr Femi Adesina, the President’s Special Adviser on Media and Publicity said the president would pay official visit to Maiduguri from where he would proceed to the UK. The presidential aide further revealed that President Buhari would return to Nigeria on May 5. Chief Tunji Alapini, a retired Assistant Inspector General of Police (AIG) today celebrates his 38th wedding anniversary with his beautiful wife, Ibipo. Alapini who holds a Master's Degree in Criminology from the University of Wales United Kingdom took to Instagram this morning to say, '38 years and still waxing strong. Three kids, all married. Grand children and still counting.To God be the Glory. Happy Wedding Anniversary to us'. Nipsey Hussle's mother says she's been communicating with her son Ermias "Nipsey Hussle" Asghedom via a psychic medium. Nipsey's mother, Angelique Smith, said that after her son was shot dead by Eric Holder, his spirit rose out of his body and chased his killer. She said: "His spirit came up out of his body, immediately. The medium told me that he told her that he chased Eric Holder. His spirit, his spirit chased after him, like a superhero, you know? He came out of his body, he said, 'quickly,' and there was especially no pain. And like a superhero, he was already chasing, you know? But what did he do at first? He shook his hand. He was a gentleman. My son was a gentleman." However, web users are not exactly enthusiastic by this revelation. They have said it is understandable that Nipsey's mother will want to seek comfort by searching for answers in all sorts of places. But they warned that these psychics are just "actors" trying to make money. The Senate has postponed the passage of the 2019 budget till Tuesday, April 30th 2019. Senate President Bukola Saraki, announced this during plenary today April 24th. According to Saraki, the postponement is because of the absence of the Chairman of the committee at plenary and to also enable committee members to study the budget details before passage. He asked the National Assembly secretariat to ensure that senators get copies of the bill ahead of passage. “Some members have not got printed copies of the details and I have directed the Clerk to make sure that latest by Monday we all have printed copies so that everybody can see the details of the budget, and by so doing, we can now pass it on Tuesday. “We don’t want to run into a problem where we pass it without details and our colleagues will start to comment. So, Clerk, ensure that everybody has copies of the details by Monday and we will pass it on Tuesday,” he said. According to Friday Emmanuel, Obiora Nwabueze(the tall one) asked him to steal used female pants for a fee of thirty thousand Naira. However, after he had successfully accomplished the task, Obiora Nwabueze reneged on his promise and forcefully attempted to take the pants from him which led to exchange of blows. 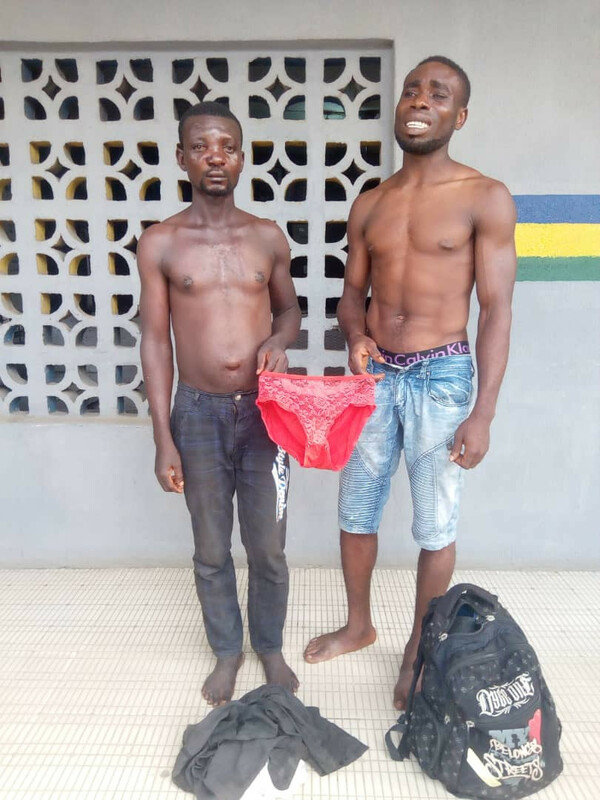 During interrogation, the said Friday Emmanuel regretted listening to his friend, Obiora, who was pestering him to get him female underwear he desperately needed to become rich. Meanwhile, both suspects were yesterday charged to Magistrate court-23, at Mbah road, Ajegunle, Lagos for conspiracy and stealing .